Mate sua vontade de emoções garantindo sua entrada no Bávaro Adventure Park, um parque temático que combina natureza e aventura. Situado no meio de 44 hectares (110 acres) de paisagens naturais, o parque de diversões para a família toda possui um simulador de voo, tirolesas, uma piscina com cachoeira, o Mundo dos Dinossauros - lar de 20 dinossauros gigantescos - e a oportunidade de descer no zorbing. Escolha entre cinco pacotes diferentes para todas as idades e bolsos. 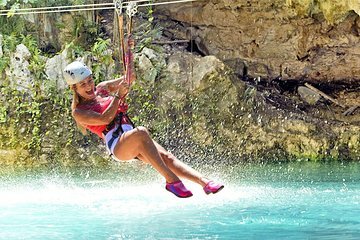 Às 7h30, espere pelo embarque em seu hotel em Punta Cana, onde você embarcará em um veículo rumo ao divertido Bávaro Adventure Park. Após um breve passeio, você chegará ao parque temático, situado no meio de 44 hectares (110 acres) de paisagens naturais. O pacote escolhido no momento do check-out determina a quais e quantas atrações você terá acesso. Se você estiver à procura de emoções, escolha o pacote Mega Splash Zipline, que inclui seis linhas diferentes, ou selecione cinco ou sete atrações - que incluem um simulador de voo, tirolesas, uma piscina com cachoeira e zorbing na descida - com um pacote Adventure ou Adventure Plus. Um pacote Adventure VIP dá acesso ilimitado a todas as atrações do parque enquanto a entrada no Mundo dos Dinossauros, lar de 20 dinossauros animados, com certeza vai divertir crianças e adultos. A excursão termina com o desembarque no hotel. When we arrived to the park, we shortly discovered that the 5 attractions that we had in our package are limited options and not just any 5 attractions that we wanted to try. No photos allowed when you do activities but they essentially have their own “professional photographers” who take those pictures for you. When we looked thru the 20 pictures that they took of us, we only liked maybe 3-4 of them. They wanted $64 dollars for one person and if there are 2 people in one photo then it’s $84 and so on.. The park was pretty fun. My biggest issues are I believe the shuttle picks you up too early in the morning because the Park isn't even open till 9am or after. We waited like an hour to even enter. My biggest issue is when we ordered this online it say 5 of your choice and that was not the case. It was 3 of our choice and then 2 I would never want to do to begin with. The Eco Tour? I got the tour walking from location to location so this is an unnecessary option. I feel like this should be more defined on the site. I paid for 5 things and ended up just doing 2 or 3 if you consider the natural pool 1 I did the Pro Zipline which was fun and I did the Zorbing which was really fun and the Natural Pool is beautiful. The guides and Photo people were very nice. If I was ever in the area i'd come back but I'd know how to order my package now so I don't feel like I've been ripped off a little. Excellent. Guides enabling movement to, and planning of, the activities chosen for the day. Immaculately kept park. Exceeded our expectations. Hotel pick up and drop off were well organised.